The following is a brief outline of the procedures to be followed in the event of an emergency or crime occurring on the campus of the College of Mount Saint Vincent. The resumption of normal activities on the College of Mount Saint Vincent campus. In the event of a significant emergency or crime that could endanger the health and safety of the Mount community, a timely warning via the Send Word Now® notification system will be issued by the Director of Campus Safety and Security or designee. In some cases, such notice is to be issued immediately. When circumstances allow time for consultation, such notice is to be issued after conferral with members of the Emergency Management Team and the Emergency Response Personnel. The College broadcast email system and website will also be used to issue notification and to keep the Mount community informed of the nature of an emergency, any instructions to be followed, and additional steps to be taken to mitigate the emergency. Timely updates will be provided as appropriate to keep the Mount community safe and informed, and to reiterate instructions to be followed. If there is an immediate threat to life and safety, call 911. IN ADDITION: Notify Campus Safety and Security by calling the main security booth at (718) 405-3434 or (718) 548-2116. The main booth is staffed 24 hours a day, 7 days a week. The booth will notify the Campus Safety and Security supervisor and proper emergency personnel. The Emergency Management Team is headed by an Incident Commander (or designee). This role will be filled by the senior Campus Safety and Security supervisor until the arrival of the Director or Assistant Director of Campus Safety and Security. Also on the team are the Dean of Students and the Vice President for Operations. In an emergency that requires relocation, evacuation, or sheltering in place, the Incident Commander will notify the Emergency Management Team and the appropriate emergency personnel. The President, Provost, and all Vice Presidents will be subsequently and promptly notified and join the Emergency Management Team, as they are able and required to do so. The Vice President for Operations will notify the President and Vice Presidents and the appropriate emergency personnel. Subsequent notifications will follow the notifications flow chart below. Pertinent information will be exchanged between Campus Safety and Security, emergency personnel, and members of the Emergency Management Team to determine the best course of action to address the emergency. Members of the Emergency Management Team will continue to contact members in the flow chart until someone is reached. 1. If evacuation of any building(s) is deemed necessary by the Emergency Management Team after conferral with the proper emergency response authority, Campus Safety and Security personnel will direct all persons in the endangered area to proceed in a calm and orderly manner to one of the following locations, and will remain at the relocation site until advised by Campus Safety and Security. In the event of a large-scale emergency that requires the evacuation of all persons from campus, the 261st Street gate will be opened to provide an additional point of egress, in addition to the main entrance at 263rd Street. Once off the campus grounds, evacuees will be directed by Security or emergency personnel to one of two short-term relocation sites, the Hebrew Home or Saint Margaret’s Parish. The Emergency Management Team will gather at the Command Post. Communications will be established and maintained among the emergency response personnel, Incident Commander, and Emergency Management Team, to ensure an effective teamwork approach and resolution to the emergency. 2. In the event for the need to relocate individuals on campus, the new gym at Peter J. Sharp or the dining area at Hudson Heights will be utilized. Temporary sleeping accommodations will be set up as needed. A Command Center will be established at the location selected. In the event of an emergency on campus, such as an active shooter, an order to “shelter in place” will be issued by the Incident Commander through Send Word Now®, the College Broadcast Email System, and if feasible, the College website. 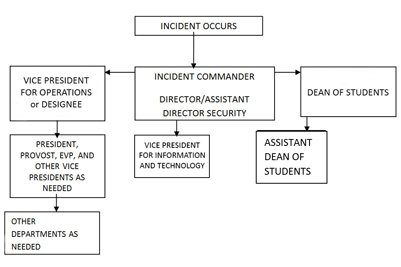 All persons present on campus must follow instructions from the Incident Commander and responding emergency personnel. The Incident Commander will consult with the Emergency Management Team by phone as time and safety permits. “Shelter in place” means to immediately cease all classes, work, and business operations. Every person must stay within the room in which she/he is located and lock any windows or doors. No person shall leave the room in which they are sheltered without an explicit notification or instructions from the Incident Commander or responding emergency personnel.